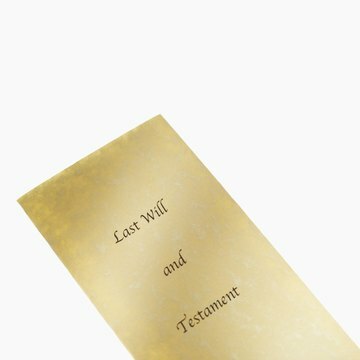 A last will and testament is a document that sets forth the wishes of a deceased person, called a decedent, for the distribution of his property after his death. For a last will and testament to have legal effect, an individual named in the will, called a personal representative, must present the will to a Texas probate court. While the formal requirements for drafting a will can be generally technical and extensive, Texas law permits the creation of holographic wills, which is a will that is handwritten by the decedent. Texas law relaxes the formal requirements for accepting a holographic will to probate court. Obtain a pen and several blank pieces of paper. Texas law only recognizes holographic wills that are entirely handwritten by the decedent. Any typewritten or computer-written phrases in a holographic are ignored by the probate court. A will that is typed up and signed does not comply with the Texas holographic will statute, and would have to comply with the Texas formal will statute, which requires the signature of disinterested witnesses. Declare that you are writing your will and are of sound mind. In order to accept a holographic will, a probate court judge must conclude that the decedent had testamentary capacity when drafting the will. Testamentary capacity requires a decedent to understand the value of his property, the natural objects of his bounty, which are family members and other people close to him and the disposition he is making. Additionally, if you have any other wills currently in existence, indicate that they are revoked. Set forth your property and to whom the property will be bequest to. It is not necessary to list every item being bequeathed. Categorical bequests, such as “my automobiles to Jane” or “my clothing to Jack” are a sufficiently specific bequests. However, merely listing fractions of your estate, such as “one-half to Jane, one-half to Jack” is not sufficiently specific. Describe the circumstances of any unusual bequests. If you are leaving a close relative out of your will, such as a child or sibling, he may challenge your will on the basis that you were not of sound mind when making the will. Explaining in the will why they have been left out or have not been bequeathed a traditionally proportionate share would be a prudent practice. Sign and date the bottom of the will. Draft a self-proving affidavit. If you draft a self-proving affidavit, you will not need any witnesses to testify the will is in your handwriting. On a separate piece of paper, set forth that you are over the age of 18, of sound mind when the will was drafted, have not revoked the will and that the will is your last will and testament. Sign the self-proving affidavit and attach it to your will. Deposit the will with the probate court. Texas law permits an individual to deposit her will with the county probate court during her lifetime for a fee of $5. Contact your local probate court for its procedure for accepting deposited wills. After depositing your will, you will receive a certificate of deposit from the probate court. You should keep this certificate in a safe place. What Is the Meaning of Last Will & Testament?